Brands still struggle with the hashtag – some more than most. What starts as a good-natured appeal to the public often ends in a feeding frenzy of snark and outrage. To avoid a #HashtagFail, Twitter’s head of global brand strategy, Alex Josephson, told PRWeek that brands to look at a hashtag from every angle before publishing. "Think to yourself: what can go wrong, how can this hashtag be misinterpreted, are we playing in a space that is appropriate for us to brand?" said Josephson. "Scenario plan for negative reactions." Below are eight examples of how not to use a hashtag as part of a marketing campaign. McDonald’s wanted to take Twitter behind the scenes and reaffirm its commitment for fresh produce with #MeetTheFarmers, following that up with another tweet: "‘When u make something w/ pride, people can taste it,’ McD potato supplier #McDstories." Or instead of pride, as many users noted, you can taste someone’s toe nail in your burger. Or the sweet bliss of food poisoning. Yum. JP Morgan Chase sent out a tweet, asking users to send questions about career advice. It was intended to give college students an opportunity to communicate directly with a senior executive. However, the hashtag provoked sarcastic posts such as "Can I have my house back?" and "How do you decide who to foreclose on? Darts or a computer program?" The bank cancelled the session less than six hours after the call with the post "#Badidea! Back to the drawing board." Two years after the documentary Blackfish aired on CNN, SeaWorld handed the mic over to Twitter so users could answer any questions about their animal care practices. Animal activists did not hold back; even though the hashtag is two years old, they are still using it to communicate with SeaWorld today. In the wake of nationwide protests against the decision to not indict a police officer for killing Michael Brown, Howard Schultz and others decided Starbucks should try to spark a conversation about race – in your local coffee shop. IBM didn’t foresee the blowback from his campaign to encourage women to enter STEM, asking them to hack a hair dryer. The company was criticized for accomplishing the opposite of what it intended. This hashtag was used to promote an album release party for Susan Boyle. Story short: capitalization matters, folks. Australian airliner Qantas launched a competition, inviting users to describe their "dream luxury in-flight experience" for the chance of winning a prize. Apparently, Twitter didn’t care about winning pajamas and a toiletries kit. 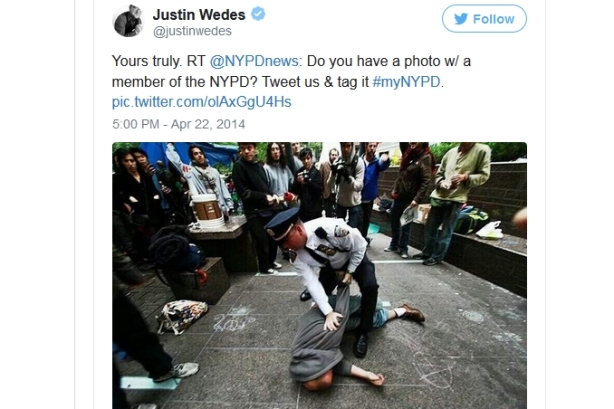 The New York Police Department asked residents to tweet pictures of themselves with police officers. The campaign soon turned into a collage of police brutality images. Gloves Off: Is the hashtag still relevant for brands? Your call: Is the hashtag dead? Did The UPS Store need to delete its controversial Christmas tweets? What the !#@% is PR?